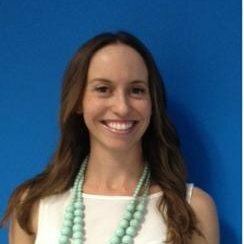 Our HR analytics team at LinkedIn crunched the numbers, and the results were staggering: employee referrals are our most efficient way to hire and, more importantly, a hire sourced via a referral generally stays around longer and performs better at LinkedIn than a hire sourced through any other method. Hence, we really care about employee referrals, and push ourselves to be leaders in the industry. To make that happen, we worked with our product team to help build LinkedIn Referrals, a product intended to optimize companies’ employee referral programs. And we started using it globally in September 2015, as a beta customer. A few metrics jump out. Comparing the three months before we launched LinkedIn Referrals to the three months after, 17 percent more of our employees have participated in our employee referral program by referring at least one candidate. We also hired 11.4 percent more people via referral in that time, and it took us about two weeks less to hire a referred candidate. The reason behind those numbers is largely attributed to a vastly improved experience for both referred candidates and referring employees. LinkedIn Referrals requires less work for employees to refer, but also helps employees better understand who they should refer for positions. The past five months have been instructive as well, since we’ve transitioned from our old referral tool to LinkedIn Referrals. During that time, we learned the keys to getting widespread adoption and optimal use from the product. As mentioned, one of the biggest drivers to our improved metrics after using LinkedIn Referrals is far better experience for referring employees and referred employees. Before we had LinkedIn Referrals, referring candidates at LinkedIn was harder. First off, our employees were often unaware of what positions were open within our company, outside of their team. Second, if they did want to refer, they had to log into one of two ATSs, search for the specific job they wanted to refer someone to and then personally enter the referral’s information. Because this process was tedious and burdensome, it also meant that our employees often tended to refer one person for as many openings as possible in one go. For example, if someone wanted to refer a person to a software engineering position, they would routinely refer them to every open software engineering role at our company. That would mean extra work for our recruiting team and a lower chance of the candidate being a great fit for the open role. Ultimately, it made for a poorer experience for both the referring employee and the referred candidate. 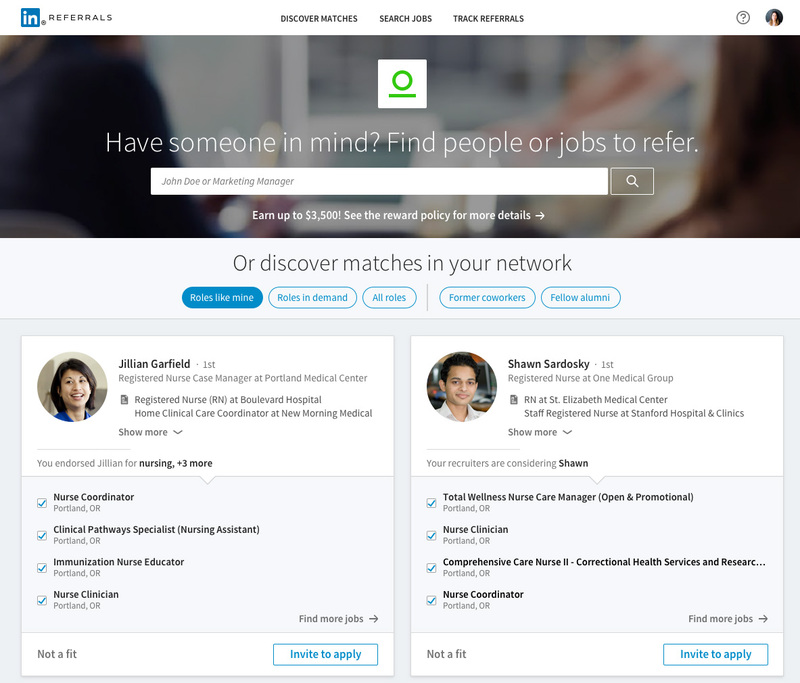 Employees can log into the system and see what positions are open, and the LinkedIn connections who would make good referrals for those jobs. Additionally, employees are periodically emailed open positions at LinkedIn and suggested candidates within their network, which helps keep referring top-of-mind within our workforce. 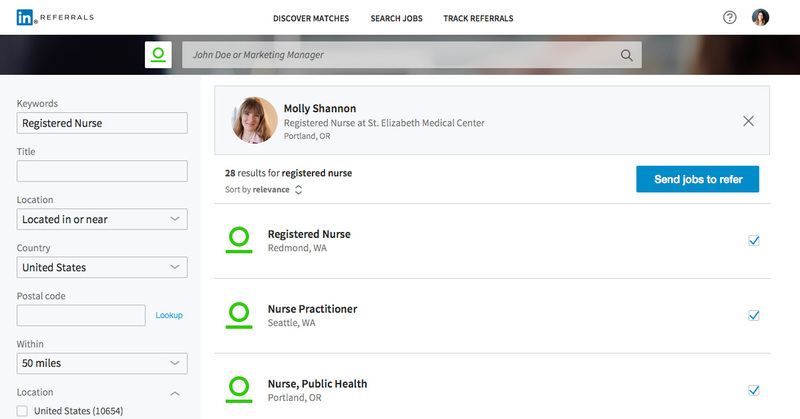 Employees can search a friend’s name within the system and see what open jobs best suit them. Say one of our employees has a friend who tells them they are interested in working at LinkedIn, but isn’t sure what position would be best for them. 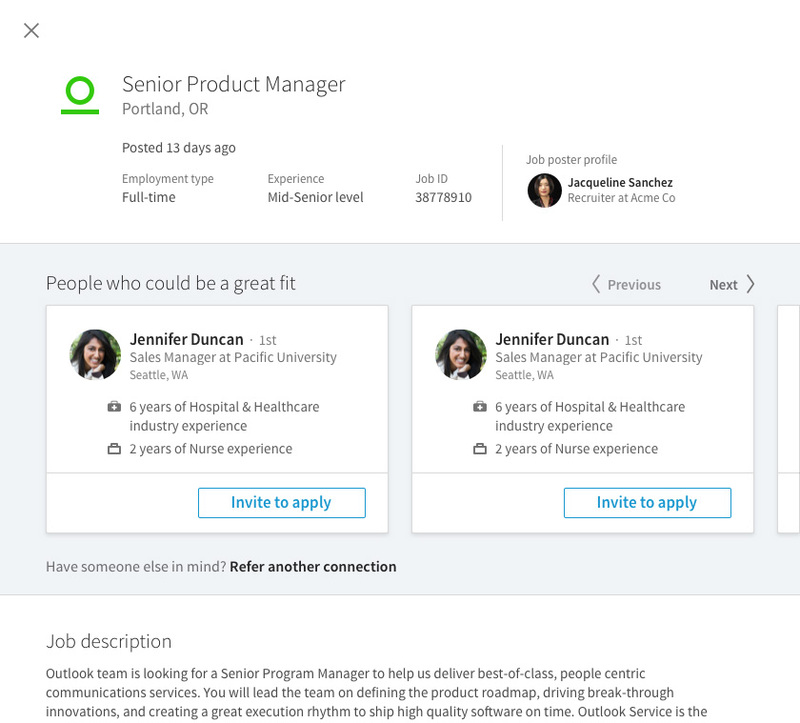 Using LinkedIn Referrals, the employee can search the person’s name, and our algorithm will match what jobs best suit them, based off the information in their LinkedIn profile. Employees can search for open positions at LinkedIn and then see who in their network would be best suited for the role. Conversely, you can also search what jobs are open at LinkedIn under the “Jobs” tab at LinkedIn Referrals, and then see who in your network would be best suited for those roles. For example, if you searched “marketing” in the jobs tab of LinkedIn Referrals, you’ll see the open marketing positions at our company and people in your network who are suited for those roles. A key point here: in the three ways listed, an employee can prompt a friend to apply for a position via LinkedIn Referrals, but can’t submit their application. Instead, in all cases the referred candidate is sent a message asking them to apply to the position, which they can do if they are legitimately interested. This avoids people being referred to dozens of positions or employees referring people who wouldn’t seriously consider the job. If the referred connection does apply, LinkedIn Referrals allows the referring employee to see the status of their referral. This keeps them informed while also eliminating “can you update me” emails between the recruiter and the employee and makes for a smoother process for all parties involved. This is largely a result of the improved referral experience outlined above. LinkedIn Referrals is compelling more of our employees to refer by both keeping open positions and strong candidates in their network top-of-mind. The result is 17 percent more employees participating in our employee referral program the before by referring at least one person and, most importantly, more jobs being filled via referral. One thing we found since we started using LinkedIn Referrals is that positions sourced via a referral were filled faster than they were previously. In the three months before we used the product, it took us 67 days to fill a position, if that position was sourced via a referral. In the three months after, that number was cut to 54 days. What’s the reason for this? By requiring referred candidates to apply for the role themselves, instead of the referring employee essentially doing it for them, it ensures the candidate is actually interested in the position and increases their role in the process. It also increases the quality of the referral, as people are less likely to apply for jobs they aren’t qualified for. That allows recruiters to have conversations with the right people faster, which ultimately speeds up the hiring process. One of the great aspects of LinkedIn Referrals is that it helps market your referral program for you. Once your employees log into the program, they are shown jobs that are open at your company and even the LinkedIn connections who are the best fit for those openings, and employees are sent emails with that information as well. That said, keeping referring top-of-mind with our workforce, while making it clear what we are looking for in a referral, is still a huge priority at LinkedIn, particularly when we transited to LinkedIn Referrals. For the transition, early adoption was key, as we wanted people to start using the platform correctly right away. First and foremost, our CEO, Jeff Weiner, and the rest of the leadership team bought into the product and encouraged all employees to do the same. That leadership proved crucial to getting widespread adoption. We make it a point to talk about the importance of referring candidates at different departments’ all-hands meetings. Team leaders will often share critical job openings and rally their reports to refer. When we launched LinkedIn Referrals, we put information on how to use it on everyone’s desk, held informal Q-and-A sessions after all-hands meetings on how to use it, made a video explaining why and how to use LinkedIn Referrals and put up posters around our offices promoting referrals; among other tactics. We revamped our internal referrals website, which houses tools, resources and tips to gain insight and guidance into our employee referral program. One thing we discovered at LinkedIn is that people are most likely to refer within six months of starting a new job. Knowing that, in the first six months of an employee’s tenure we have designated touch points emphasizing the importance of referring at LinkedIn, so new hires are even more likely to refer. To recognize employees who are doing a great job of referring high-quality candidates, we give out “Talent Magnet Awards” quarterly. When marketing our referral program, we try to make clear to employees that it isn’t just about quantity, as the quality of referrals is ultimately more important. We do our best to define what makes a good referral at LinkedIn, so people know the type of people they should be referring. Even before we started using LinkedIn Referrals, we committed to our employees that we would seriously consider each referred candidate. That means each referral is reviewed by our recruiting team within 48 hours. That’s critical, because we found that drastically increased the quantity and quality of our referrals. If people don’t trust that you are seriously considering their referrals, they’ll grow disillusioned and stop referring people. Once we started using LinkedIn Referrals and more employees started to refer, that only became more important. Now that we were getting referrals from more employees than ever – including employees who had never referred before – it was critical we made a good impression. Otherwise, we knew that people would lose faith in our referral program and stop referring altogether. LinkedIn Referrals helps with this, as referring employees get updates on the state of their referral through the platform, but that’s only half the battle. We still need to and continue to come through on our promise of considering each referral, so that trust is continually reinforced. The biggest adjustment in our recruiters’ day-to-day life since launching LinkedIn Referrals is an increase in referred candidates. 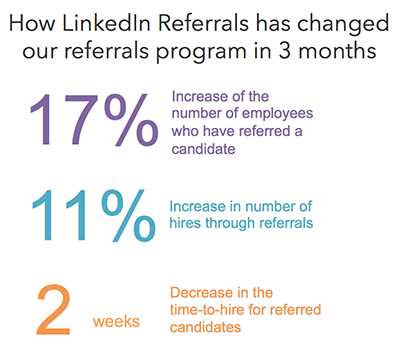 Specifically, we’ve seen referrals per open job increased by 5 percent since we began using LinkedIn Recruiter. What we are encouraging all our recruiters to do is to focus in on those referred candidates. As our data clearly shows, referrals are one of best sources of hire, so they should be prioritized. It’s been an exciting five months at LinkedIn, using our own product. As the numbers show, we’ve managed to accelerate our referral program, but our employees have also provided invaluable feedback on the product that has helped make it stronger. Change management has not been a major issue, particularly regarding our employees looking to refer. Again, since LinkedIn Referrals is easier to use than our old system, many of our people were eager to shed the old way to and start with the new. The evidence for that is we are seeing more of our employees referring candidates. Ultimately, the product is doing exactly what it is designed to do: Optimizing the referral process, so our employees are routinely considering people in their networks that could be a good fit for LinkedIn. We believe the referrals that come out of it will lead to more great talent coming to LinkedIn, and give us an edge as a company going forward.